Join thousands across the country to raise money for the American Foundation for Suicide Prevention, our nation's leader in the fight against suicide. Whether you are walking with a school organization, athletic club, or family and friends, this is the best way to get everyone together under the same banner. Learn more about what it means to be a team captain HERE. Although no one ever walks alone, you can always register to walk as an individual and meet other members of the student community the day of the walk. Don't see a walk near you? 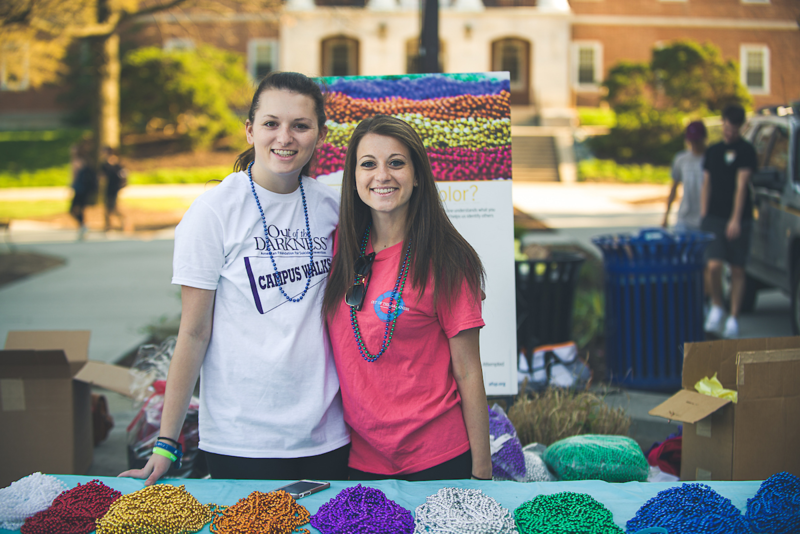 Our Out of the Darkness Campus Walks are led by volunteers like you across the country each year between March and June, and you can join the fight against suicide by starting a walk near you. Email walks@afsp.org with your city, state, and school affiliation and we'll connect you with an AFSP field staff member for more information. The Out of the Darkness Sponsor Program provides the opportunity for companies to take an active role in suicide prevention by joining our network in more than 100 cities nationwide. There are several opportunities for your company to make a difference, including National Sponsorships, Retail Opportunities, Multi-Market & National Team Participation, and Local Sponsorships. Email walks@afsp.org for more information today!